Product #15714 | SKU P-UCA40 | 0.0 (no ratings yet) Thanks for your rating! The UltraClamp 4.0 allows a camera to be solidly attached to a rolled down car window, bicycle handlebar, picnic table, or other similar object. 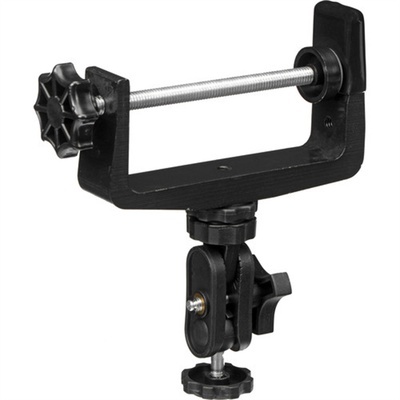 Strong enough to support most cameras, spotting scopes, and camcorders, the UltraClamp 4.0 attaches to round or flat objects up to 4" (10 cm) thick. The UltraMount used on this clamp can be attached on the top or side of the clamp for maximum versatility. The UltraClamp 4.0 utilizes the same ball and socket mount found on UltraPod® II to allow the camera maximum flexibility in framing the subject. UltraMount on clamp can be attached on the top or side of clamp for maximum versatility. Durable, aluminum clamp body and screw. Injection-molded, glass-reinforced nylon thermoplastic resin clamp head and knobs. Positions device at any angle. Attaches to round or flat objects from 0"–4" (0 cm–10 cm) thick.